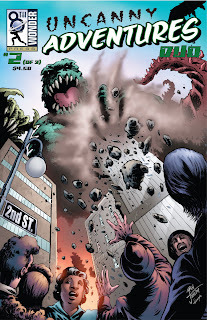 Uncanny Adventures Duo part 2 of 3 is now out from 8th Wonder Press. Each issue is a selection of 2 page stories with a specific theme for each issue. My story "The Solitary Swordsman" appears in this issue with great art by David Newbold and terrific letters by HdE. Why not pick up a copy of each issue. You don't want to miss out on this. Cheers.